York is a name that has always been associated with reliability and innovation. Since 1874, York has manufactured leading-edge heating and cooling products for both commercial and residential customers. York’s current generation of furnaces and air conditioners can be found performing efficiently and dependably in businesses and homes across the country. For both new construction and replacement applications, York has a budget-friendly product that will meet all your performance expectations. Nearly half of all York furnaces, heat pumps and air conditioners have earned the coveted Energy Star label. A product certified by Energy Star can reduce fuel and power consumption by up to 25 percent when compared to standard models. Split-System Air Conditioners: York features a variety of split-system air conditioners, including the ground-breaking Affinity Series. Models are available in efficiencies up to 18 SEER, and the Wi-Fi residential communicating capabilities provide better temperature and humidity control. Furnaces: Affinity Series furnaces offer efficiencies up to 98 AFUE, which is considerably higher than standard models. The proprietary ClimaTrak Comfort System helps create a custom operating cycle that’s optimized for your area. A variable-speed blower combined with modulating burners provide exceptional comfort in all weather conditions. Split Heat Pumps: Heat pumps operate in the same basic manner as an air conditioner, but a reversing valve allows the unit to provide heat in the winter. 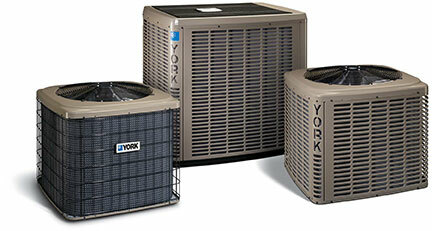 York Affinity heat pumps incorporate QuietDrive sound reduction technology for ultra-quiet operation. Providing 18 SEER air conditioning and 10 HSPF heating efficiency, Affinity Series heat pumps can help lower your utility costs while keeping you comfortable all year round. Package Units: York manufactures package units in a variety of different configurations including gas/electric, heat pump and straight AC. Package units are best suited for rooftop applications where ground space is limited and an all-in-one heating and cooling solution is needed. Air conditioners with efficiencies up to 18 SEER. The residential Affinity Residential Communicating Control offers Wi-Fi and smart-phone compatibility for managing up to six separate heating and cooling zones. Every unit is backed by a premium warranty to provide confidence through many years of reliable operation. Air conditioners can include a two-stage compressor for exceptional efficiency and low noise. If you need HVAC installation, repair or maintenance services, we can help you find the best local York contractors. Once your inquiry is received, one of our dealers will contact you to arrange an appointment at your convenience, or use our Dealer Locator page to find a dealer close to home.